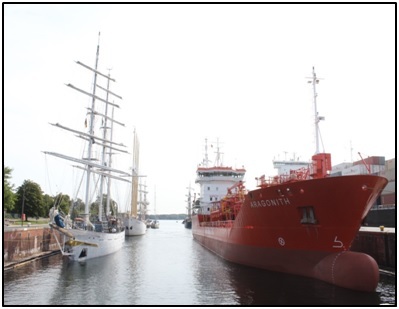 The ship cast off from Rostock on 09 Aug 15. 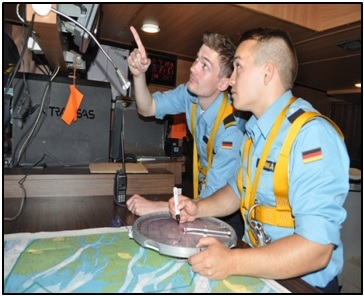 The ship embarked three Midshipmen from the German Navy Slt Daniel Tim and Slt Joachim Mrnka for the passage from Rostock to Bremerhaven. 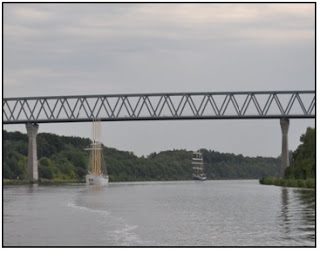 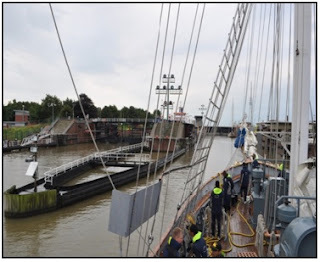 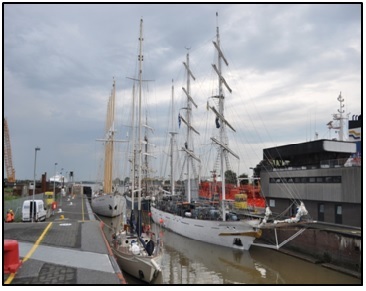 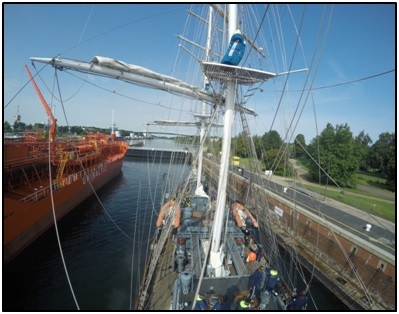 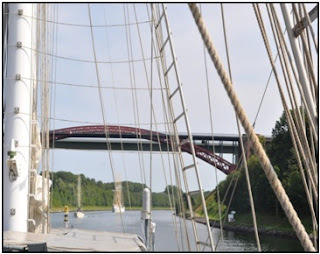 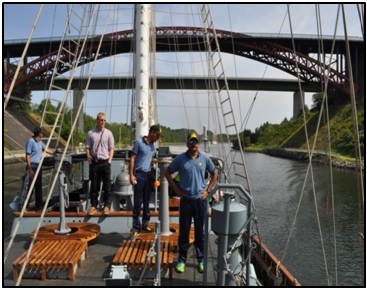 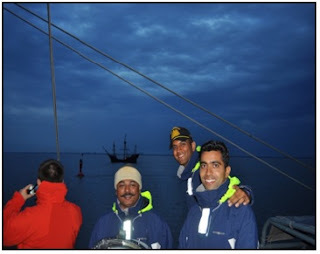 Upon weighing anchor at 0900 on 10 Aug 15 the ship started making way to enter Kiel Canal. 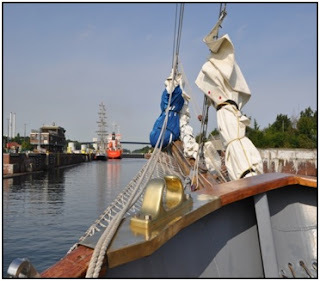 Ship entered the west locks of the canal at 1000 and commenced its transit through the canal. 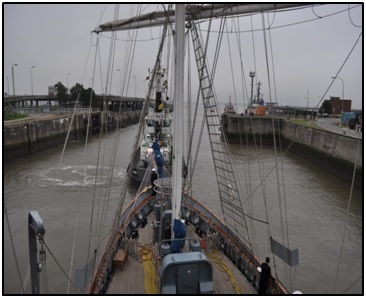 The width of the navigable waters of the canal is 100mrts and the length of the canal is 55NM. 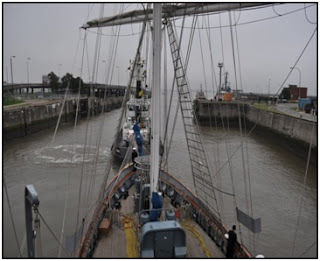 SSD was closed up at 1000 prior to entering the locks. Upon entering the locks the ship secured alongside portside in the locks and waiting inside the locks for the commencement of the transit. 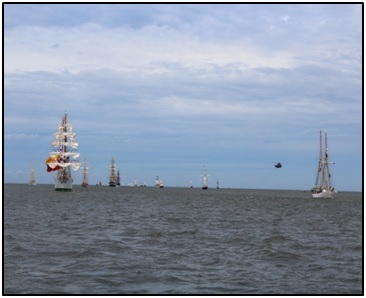 All the sail ships transiting from Rostok to Bremerhaven were lined up in a column and a speed of 8 knots was promulgated for the passage. 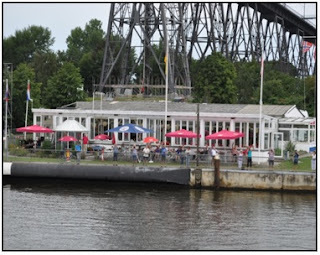 During the passage through Kiel Canal, the ship passed a popular local restaurant at Kiel Canal which dips the German Flag and played the National Anthem of the passing ship. 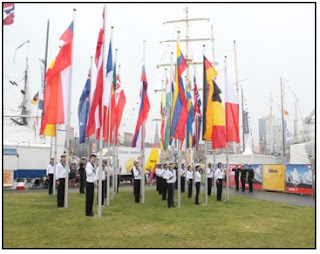 The ship in turn dipped the Naval ensign. After 8 hours of passage through Kiel Canal the ship entered the exit locks for entering river Elbe. 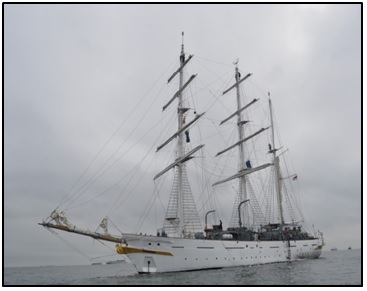 The ship anchored Off Bremerhaven and undertook the maintenance and preparatory activities for entering Bremerhaven. 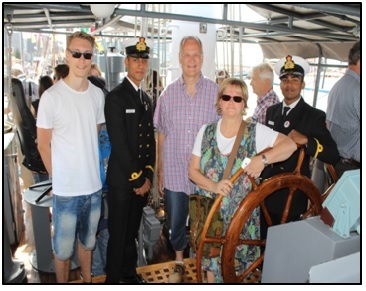 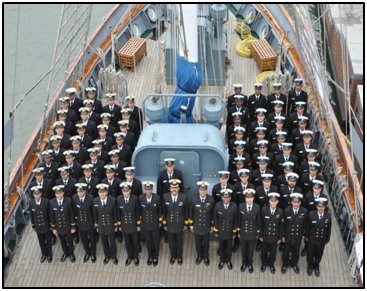 On 11 Aug 15 country presentation on Germany and the port of Bremerhaven was given by the on white watch which was followed by a presentation given by the German Officers on STS GORCH FOCK. 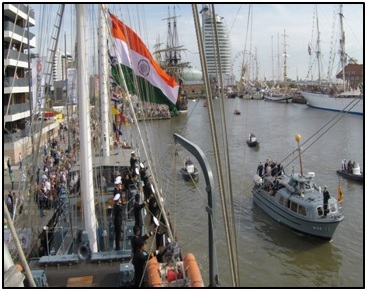 On 12 Aug 15 the ship proceeded to take up station in the column for Parade of Sails. The ship was in company of 86 other big and small sail ships and hundreds of small boats. 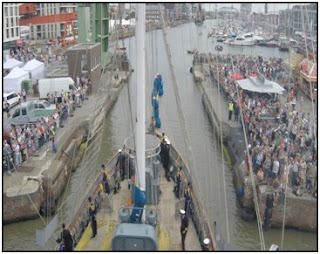 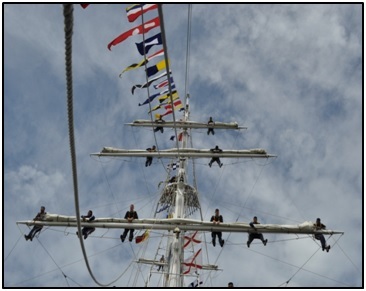 The majestic appearance of the ship with the Tall Ship Flag set and the yards manned was appreciated by one and all. 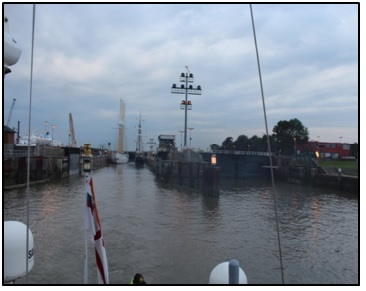 The President’s Barge with President Gauck was scheduled to steam past the berthed ships at 1630 hr. 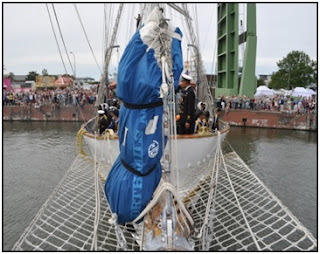 The ship quickly manned the sides with the crew dressed in dress No. 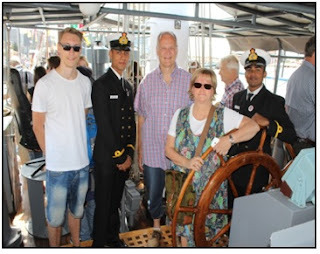 3 and accorded the President of Germany full ceremonials along with “Teen Jais”. The Commanding Officer and the DA attended a reception on the German Frigate and had the opportunity to interact with the President of Germany. During the Interaction the President welcomed the ship to Germany and indicated that the crew of Tarangini was the one of the few who were there in full strength to greet the President and the effort put in by the crew was appreciated. An Indian ship and that too a Sail Training Ship is a rare commodity in this of the world, the jetty was thus crowded even before the Brow was passed to the Jetty. The ship was dressed overall and kept open for a continuous stream of visitors for the rest of the day. 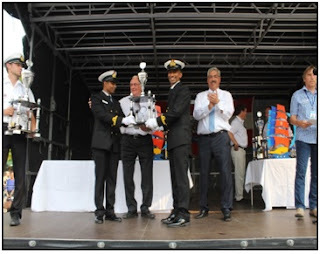 On completion of the crew parade prize distribution ceremony was conducted in the main stage. 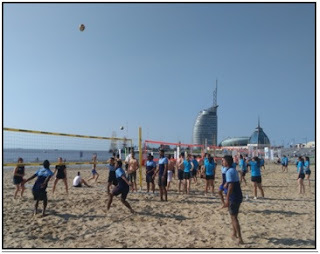 The ship received Runners Up trophy for volley ball competition during the prize distribution ceremony. 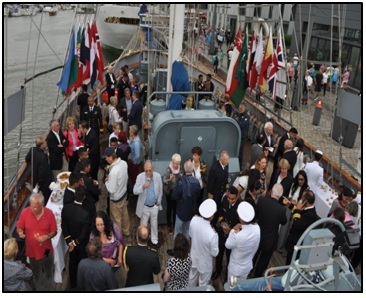 A grand reception was hosted onboard at 1600 hrs on 15 Aug 15 to mark the 69th Independence Day Celebrations. The ship remained dressed overall for the occasion. The reception was attended by Lord Mayor, Chairman of Sail Bremerhaven, President of the Bremen Parliament and Captain of various sail ships. 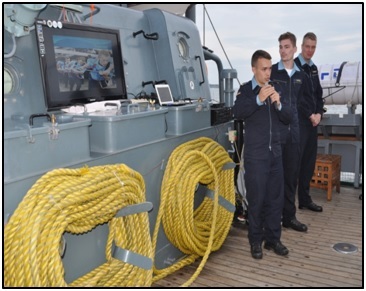 The Commanding Officer addressed the gathering and expressed his gratitude to the German government. 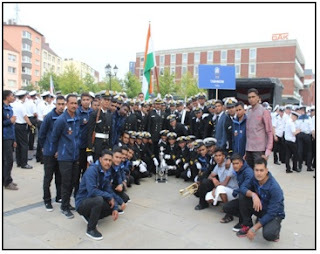 After this he gave a small brief on the rich cultural heritage of both Germany and India and off our links in this history, our fight for Independence and then invited everyone to join the celebrations. 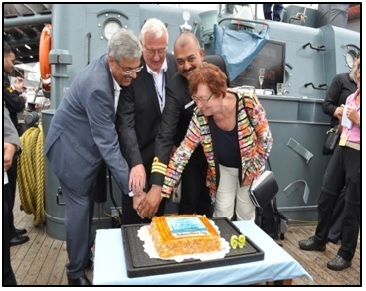 A cake displaying the Ship’s silhouette and 69th Independence Day was presented by the Sail Event organizers. The Captain alongwith the Lord Mayor of Bremerhaven, the chairman Sail Bremerhaven and the President of the Parliament of Bremen, cut the cake. 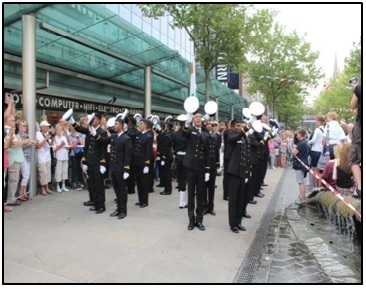 The highlight of the evening was an impressive performance by the Ship’s bugler who played patriotic songs as the Sea Trainees joined in as Chorus. 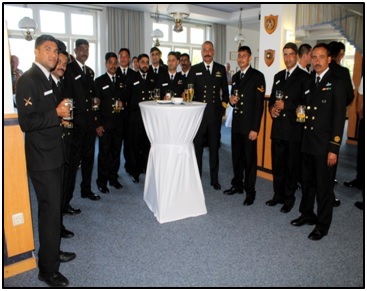 The guests were served Indian delicacies prepared by the ship’s cooks. 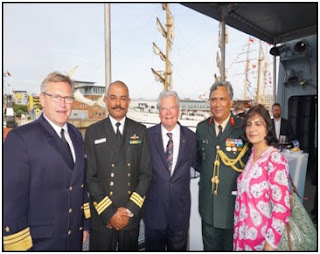 With captains of various tall ships attending the reception the evening turned out to be a great occasion to reach out to International maritime community. Captain’s divisions was held in Dress No.3s onboard as part of Independence day. 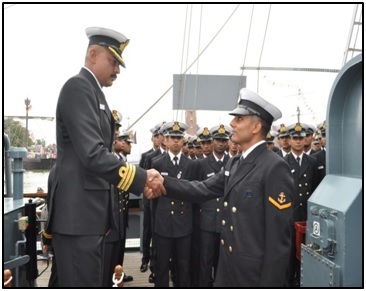 During the divisions CNS and C-in-C commendations were awarded to the winners. In his address the Commanding Officer congratulated the winners and also the ship’s company for the continuous hard work and dedicated efforts put in at all levels for ensuring the operational efficiency at sea for such a prolonged duration.